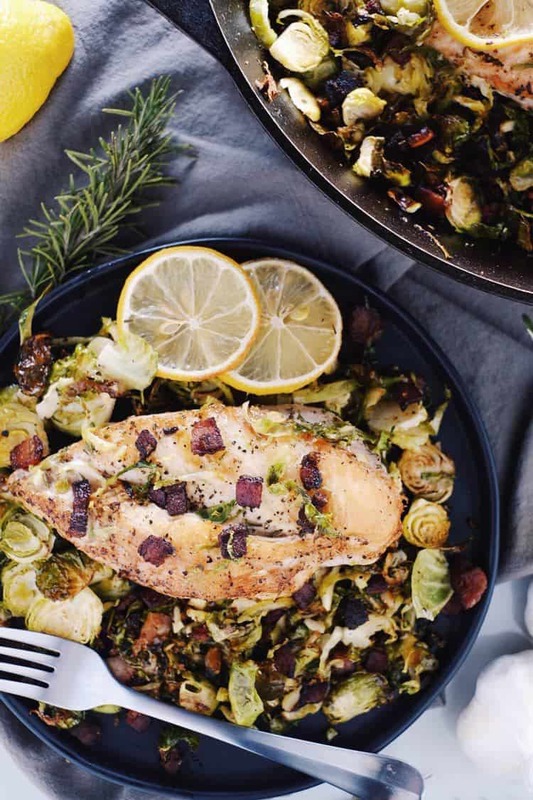 We are always trying to create simple recipes that require minimal ingredients and effort, but still yield a flavorful and satisfying meal. 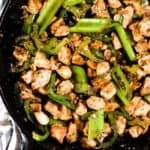 This Paleo, Whole30 + Keto black pepper chicken is a tasty stir-fry recipe that is an easy weeknight dinner and family-friendly meal. Usually when I think of stir-fry, I think of teriyaki. 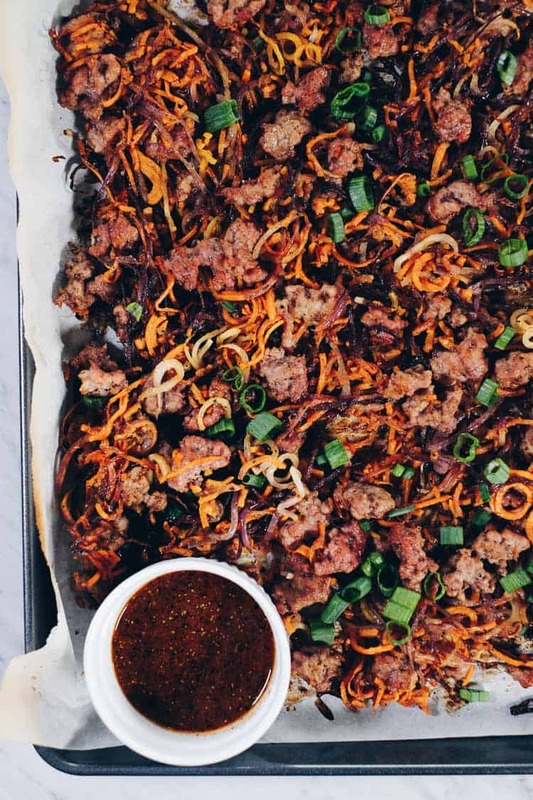 I grew up with lots of teriyaki, and it was a go-to stir-fry for sure. 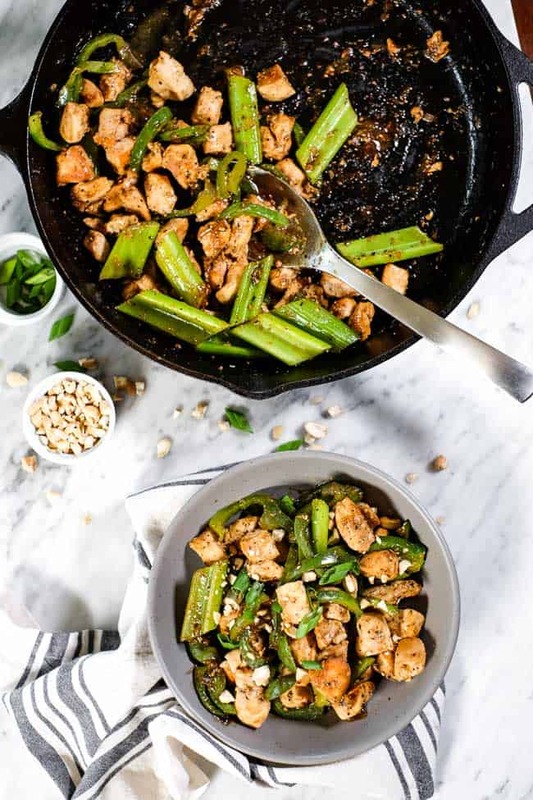 This black pepper chicken is more of a savory stir-fry compared to teriyaki, and just as delicious and comfort food like. The bell peppers give it just a hint of sweetness, and we love the crunch of the celery! 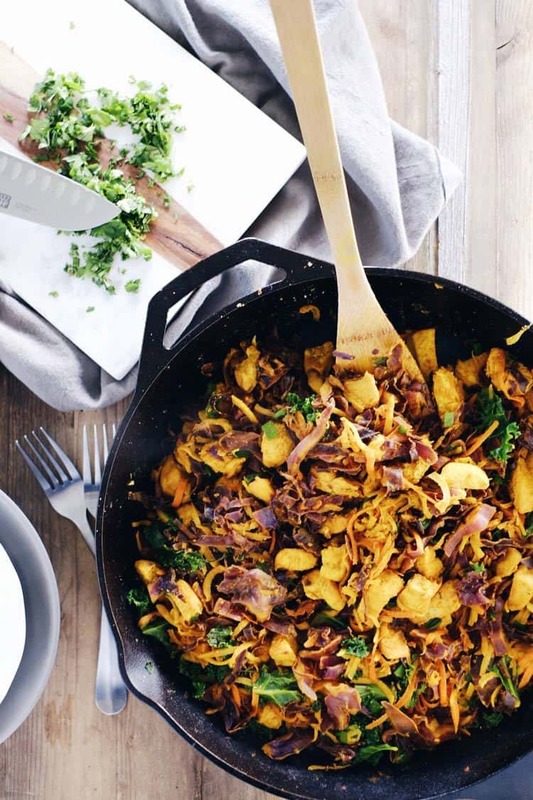 You can even top it with some roasted cashews as well for a little more savory goodness! Growing up, my mom would always use cornstarch to thicken sauces and soups. Given we don’t really do grains regularly at our house, we don’t cook with cornstarch. Instead, we have found that Bob’s Red Mill Arrowroot Starch does the job real well, and it is our sauce thickener of choice! It’s super fine and mixes in easily. 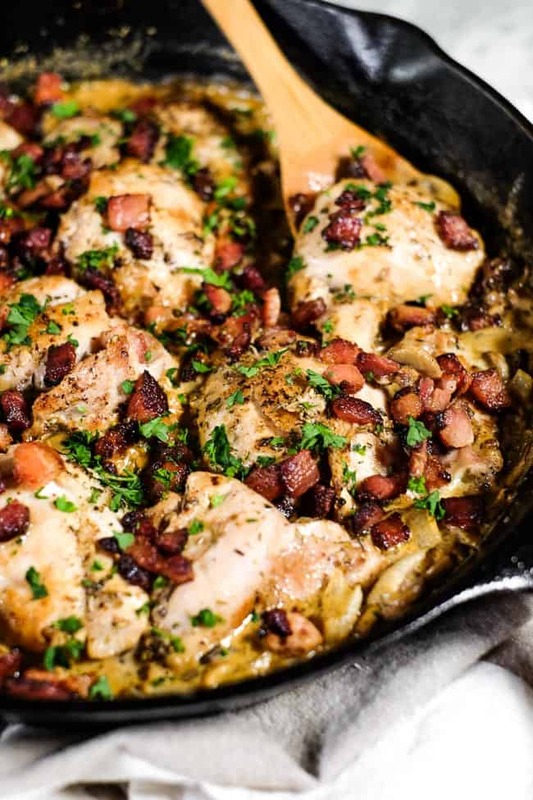 You can use it in a sauce like we do for this black pepper chicken, in a roux like when we make our creamy casseroles or in a soup. There are really lots of options – we even bake with Arrowroot Starch! And if you’re wondering why we love Bob’s Red Mill – well that is easy! We’ve used their products for years and have come to rely on them for all of our grain-free flour needs! We can always count on their commitment to high quality and minimally-processed products from the mill to our table. We think it’s pretty cool that even though Bob’s Red Mill has grown to be a larger company, they keep their family feel and are employee-owned. And we always love partnering with and supporting local companies – did you know Bob’s Red Mill headquarters are in Portland, OR? 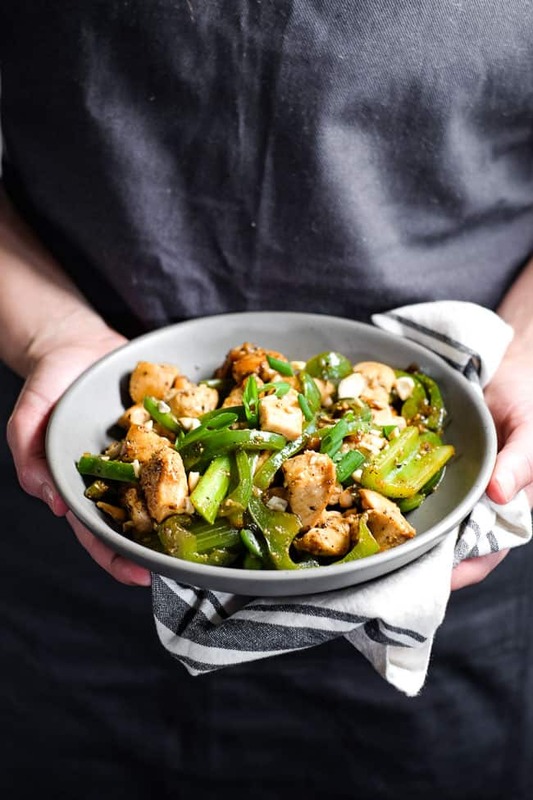 This black pepper chicken stir-fry is easy to make a full meal by simply adding some cauliflower rice, zoodles or sweet potato noodles. You can switch it up every time you make it so it feels a little different each time or just go with whatever you have on hand or sounds good. And of course, if you’re not doing a Whole30 or trying to eat lower carb, you can always pair it with some plain white rice. 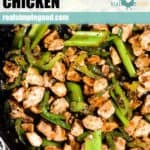 Make your work week a little easier by planning to have this black pepper chicken! 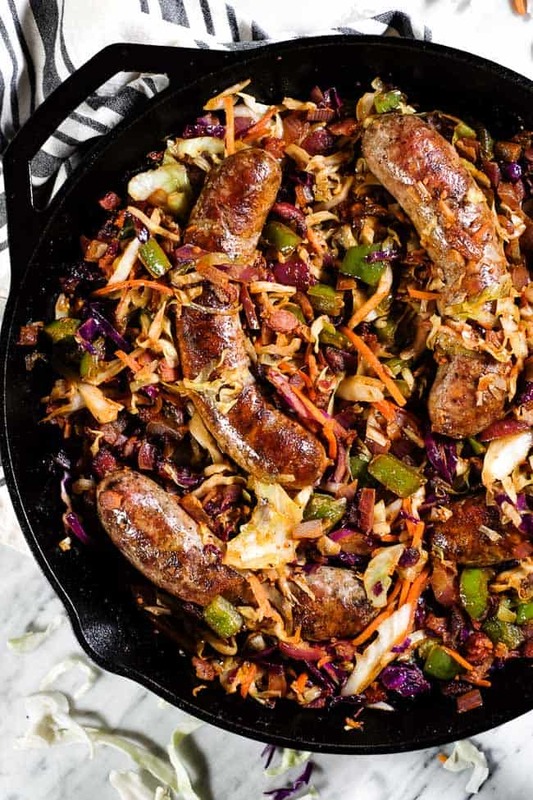 It’s a 30 minute meal the whole family will love! Leave a comment below, and let us know how it goes. Also, take a pic and tag us on Instagram @realsimplegood. Make sure to give us a follow if you don’t already! We’d love to stay connected! 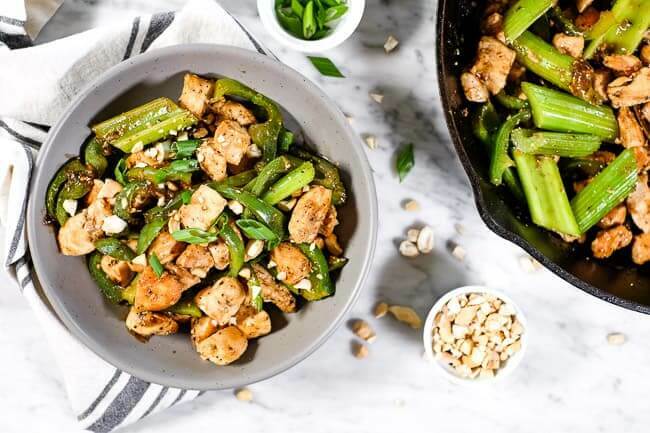 This Paleo + Whole30 black pepper chicken is a tasty stir-fry recipe that is an easy weeknight dinner and family-friendly meal that feels like takeout! Prepare chicken, bell pepper, shallot, celery, garlic and ginger as noted. 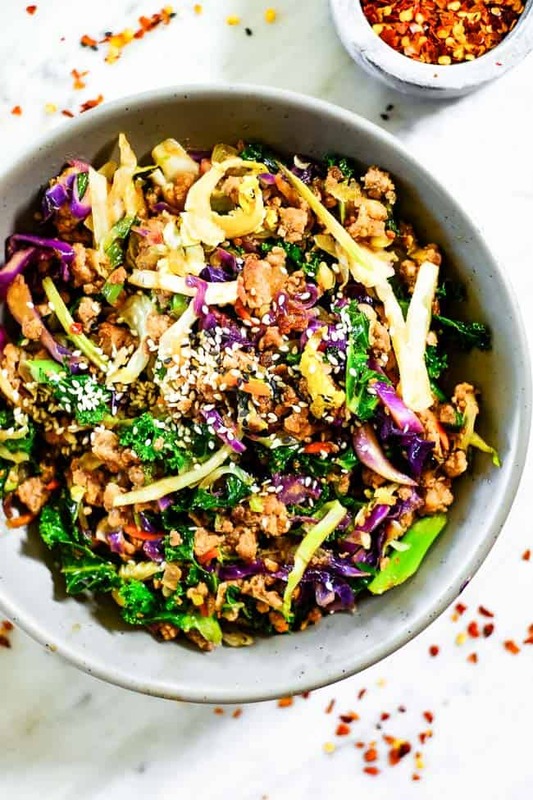 Whisk together the coconut aminos, arrowroot starch, fish sauce, vinegar and black pepper in a small bowl until combined. 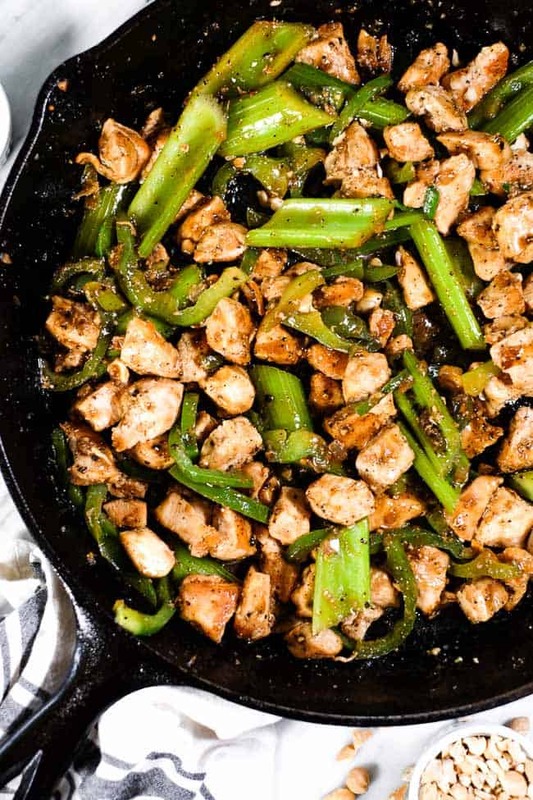 Heat 1 tbsp sesame oil over medium-high heat in a large skillet or wok. 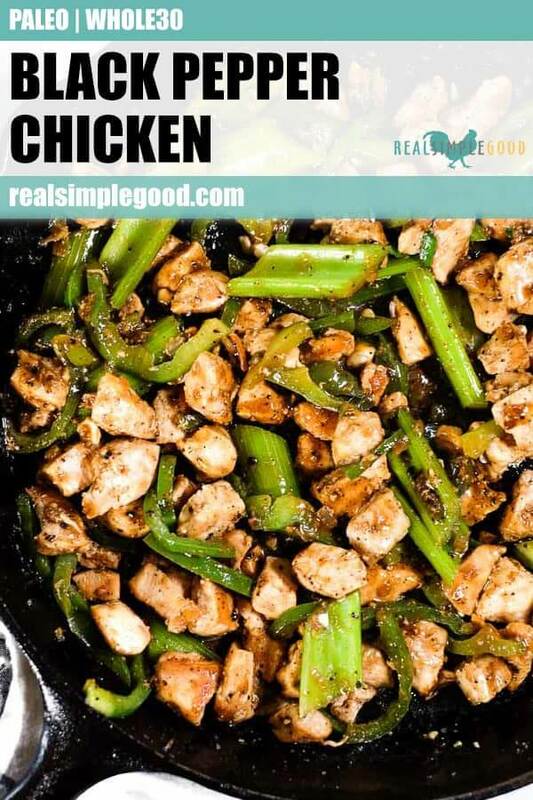 Add chicken and sauté for 5-6 minutes, stirring occasionally, until the chicken is cooked through. Transfer to a plate. Add the remaining 1 tbsp sesame oil to the pan, along with the bell pepper, shallot, celery, ginger and garlic. Sauté for 3-4 minutes, stirring occasionally. Add the chicken and sauce mixture to the pan and stir until the veggies and chicken are evenly coated. Continue to cook for 1-2 minutes, or until the sauce has thickened. Taste, and season with any salt and/or freshly ground black pepper as desired. Remove from heat and serve with any optional toppings as desired. Hi there – will tapioca work instead of arrowroot? Thanks! Yes, tapioca starch will work. I don’t have fish oil. Is there a substitute or will it work without it? You can just use more coconut aminos to fill in for the fish oil. We hope you enjoy the recipe!